We just got a call from the NICU. Clara's oxygen stats aren't getting up where they would like to see them, so she's going to be put on ECMO in the next hour or so. Chrissy and I are discouraged, but OK. We didn't want her to need ECMO, but are very grateful that she has it as a resource to fall back on now that she does need it. We are praying that this will give her an opportunity to turn the corner and start to improve. Please pray for her to respond well and get better. Neither of us has ever felt the longing that we feel now to have her get better and come home to us. It's hard to process at times that she is in a very serious fight for her life; she looks so perfect and beautiful on the outside. Chrissy and I are going to try to get some rest. If you're still up, please pray on our behalf. We love this girl. Praying so hard for you all. Hang in there and continue to hope for and expect the miracle. Praying! I'm a CDH mommy but my little guy didn't need ECMO. You can do this little one. aying for Clara and for you both as well. Our thoughts are with you especially tonight. I will be praying for Clara and the two of through out the day. My heart goes out to you all. Praying for baby Clara and Mom and Dad. May God's healing spirit be upon all of you. We are praying and haven't stopped!! Clara is such a beautiful baby! We are praying for all of you as well and know that God will give you peace and strength. We love you! Praying for Clara! My little girl, Dakota, is a CDH/ECMO survivor. 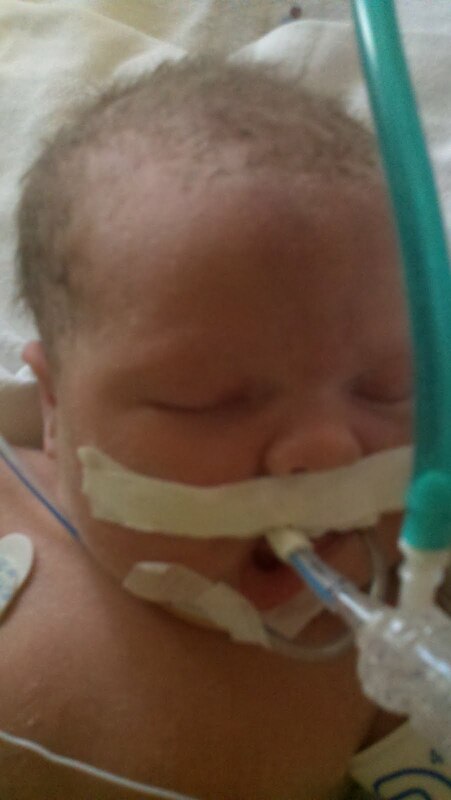 She went on ECMO her second day of life. It is an amazing machine. It allowed her to rest for the rest of her fight. She is now a healthy, perfect 2 year old! HUGS!!!!! Praying for Clara! Like Dakota, my son Andrew is a CDH/ECMO survivor too. He was on ECMO for 13 days. It saved his life! He is a healthy almost 2 year old now. I will be thinking and praying for you all! Sending prayers for you and baby Clara! I am asking my son, CDH angel MJ, to look over Clara as she fights with all her might. First off congrats on your precious baby girl- Hang in there, things will be up and down by the minute...If i can give you any advice (I am a NICU nurse and a mom to a CDH angel Elli) try to not always focus on the "numbers" enjoy the time with your baby girl, each and every minute and know that each day will bring new and encouraging/discouraging news. If you ever need anything or have any questions I would be more than happy to chat, sometimes its nice to talk to someone who's been there....I will put a link to my blog....www.babygirlreed2be.blogspot.com, ignore that i have not updated it for 2 years, but thought it might be helpful if you are wondering about any medical things. Praying with all my might!! God bless you both and your sweet baby Clara!! Continuing to lift sweet Clara up, as well as mom & dad! Praying for your baby girl. I'm also a cdh Mother, so I know the ups and downs are so stressful. Know you are NOT alone. I'll leave you a verse that helped me through some of the hardest times. Praying for all of you! Praying for endurance for the two of you as you manage the ups and downs that are going to happen minute to minute, and day to day. Praying for Clara that the ECMO will allow her body to rest and get stronger so that she continues to fight. Praying for all those who are taking care of her, that God would guide their decisions and plans for Clara and that through their hands He would touch her. Know that you are all being lifted up! please give little Clara the strength to fight. and get her number where they belong. and guide the surgeons hand with pride. So God's little miracle we all soon will see. Prayers going up for you all from Canton, GA!!! And also passing the word along....Lord hear our prayer! Prayers to you from Thailand. You have hope, good care, and a ton of support from the Granite Capital. God, our strength and shield! Praying for sweet little Clara. Bless you both. I will be praying for you and baby Clara. As a mommy and a NICU nurse I see both sides and know that my God can do anything!! I'm praying for baby Clara and your entire family. Luke 18:1 tells us we should always pray and not give up. 2 Corinthians 4:16 tells us we should remember that we are being renewed inwardly day by day. Galatians 6:9 tells us that we should focus on the harvest that will come if we do not give up. Ephesians 3:12-13 tells us that we should find comfort in the amazing ability we have to approach God with freedom and confidence. 2 Thessalonians 3:13 tells us that we should just keep doing what is right. Prayers for Clara,for the doctors and nurses caring for her,and for her parents. Prayers are powerful, miracles do happen. God be with all of you. I'm a friend of Heather Hayes & she passed on your info to me.... my 4 year old is a RCDH survivor.... he was put on ECMO his second day of life and was on it for 6 days, then had his repair surgery at 9 days old. There are so many ups & downs with CDH as you know already- & we will be praying for God's peace on you both & sweet Clara! I am praying for Clara. My daughter was born w/ CDH & did not have to go on ECMO but it was still a very long & hard road, she is now 11 years old. Miracles do happen! God bless! Thanks to all of you who have taken time to respond...especially all you CDH veterans. Your support means the world to us. Drove by Brenners two times the day after Clara was born. I shared her story with my 14 year old son who was in the car with me. Although we have not been to a church in years, we both said a prayer for her and even my big brave 14 year old got a little choked up! Many prayers and good thoughts for you all. Father in the name of Jesus, I come before You asking You to heal Clare. It is written that the prayer of faith will save the sick, and the LORD Will raise her up. And Her body is the temple of the Holy Spirit and she along with many desire her to be in Good health. The Lord is MY Sheapard I shell NOT want! In Jesus name Aman!